The first time I stood in front of a television camera, Ralph Mellanby was standing behind it. It was 1961 at the fledgling station, CFCF-TV, in Montreal. Ralph was an experienced floor manager and I was a very inexperienced rookie sportscaster. A few months later, Ralph moved into the control room and became a director, mainly involved with sports programming and almost always, I was the announcer he was directing. We began with a kids bowling show called “Pinbusters”, which was followed by a variety of programs covering hockey, football, horse racing, sports trivia, plus countless late night newscasts. It was a great training ground for both of us. In the late 1960’s Ralph left CFCF to join Hockey Night in Canada and soon became its Executive Producer. Over the next 20 years, he helped make that already established show even more popular and prestigious, guiding Canada’s beloved broadcasting institution through a series of technical and talent changes which gave the audience revolutionary views and insights to the game. Ralph introduced both Howie Meeker and Don Cherry to a nation-wide audience which was completely unprepared for their unique approach to hockey and to broadcasting the sport. 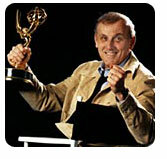 In recent years, the name Ralph Mellanby has been closely associated with the coverage of the Olympic Games. He has worked twelve Olympics, both winter and summer. He directed hockey or produced hockey coverage at every Winter Olympics from Innsbruck in 1976 to Lillehammer in 1994. For his Olympic work, Ralph has received four of television’s highly-respected Emmy Awards, including one for directing the TV coverage of the historic “Miracle on Ice” U. S. hockey victory in Lake Placid in 1980. In 1988, he was responsible for the Host Broadcast operation at the Calgary Winter Games. He was senior producer at the Barcelona Summer Games in 1992 and the Director of Venue Production in Atlanta for the 1996 Summer Olympics there. Ralph has collected countless honours including the four Emmy Awards, two Kennedy Awards, the Ohio State Award and a Gemini. Ralph Mellanby is a competitive guy. Whether it’s his beloved tennis, or golf or when he was a regular at noon-hour basketball at the Toronto Central YMCA — he’s out to win. He plays hard — but he plays fair. That’s the way he lives his life and does his job. Obviously — it works.